Trelleborg’s offshore operation is committed to continuing its work in Mexico to help educate and develop specifications aimed at improving fire safety solutions used in harsh offshore environments. To this end, Hans Leo Hals, Managing Director for Trelleborg’s offshore operation based in Norway, met with leading oil and gas representatives in Mexico over a number of months to support in improving the safety of Mexico’s offshore assets in the Gulf of Mexico. “By specifying effective and reliable passive fire protection systems for offshore oil and gas platforms, Mexico can increase the safety of personnel and offshore assets, while at the same time reducing risks, event escalation and production downtime. We believe that ensuring safety onboard any production facility is absolutely vital to reducing the risk of fire hazards and is a key priority for the region,” adds Hals. Trelleborg has completed its first two projects in Mexico focused on improving safety for offshore assets in the Gulf of Mexico. The first project was for the manufacture and installation of 530 metres of Elastopipe™ for the Nohoch A-01 platform and the second for the manufacture and installation of Elastopipe™ on the Abkatun Alpha compression platform. Both projects were completed on time, within budget and without any safety incidents. 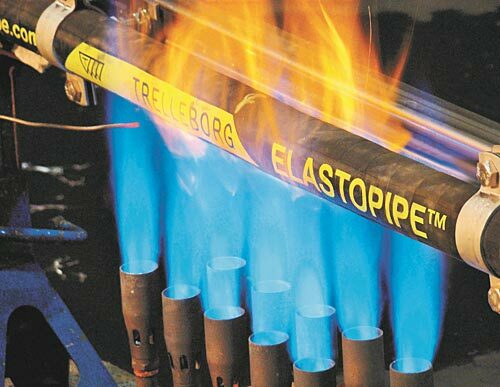 Elastopipe™ is a corrosion-free, explosion, impact and jet fire resistant flexible piping system. Its typical applications are deluge and sprinkler systems, utility and drain water systems, nitrogen distribution systems and chemicals and hydrocarbon transportation. The system is lightweight, durable and offers a 30-year minimum maintenance life, while its corrosion-free performance means system-testing frequency can be reduced to statutory requirements. Passive Fire Protection, specifically Trelleborg’s FireStop™ material, can be used for different topside applications to ensure safety comes first. FireStop™ is non-corroding and can withstand jet fires with a heat flux of 390kW/m2, temperatures above +2,552° F / +1,400° C and flame speeds that exceed the speed of sound. This makes it an ideal material choice for reducing fire hazard risks in demanding environments both onshore and offshore. Safety on offshore oil and gas installations is of paramount importance, and the need to have effective and reliable passive fire protection solutions has never been greater to ensure onboard safety. Trelleborg’s offshore operation is committed to supplying high performance, robust and dependable solutions that significantly improve onboard safety to protect personnel, equipment, critical components and structures in demanding environments.